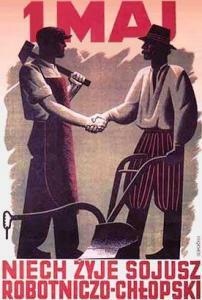 “Long live the alliance of workers and peasants” was a slogan of the Polish Communist state. That alliance ended in 1989, but the one between Poland and the Vatican — which was resumed with this protocol — has become ever closer. As announced in the Joint Communiqué from the Polish-Vatican talks, which took place in Warsaw from 4 to 6 February 1974, a meeting took place in Rome from 4 to 5 July 1974 between the representative of the Government of the Polish People's Republic, the Deputy Minister of Foreign Affairs Joseph Czyrek and the representative of the Holy See, Secretary of the Council for the Public Affairs of the Church [Vatican "Foreign Minister"] His Excellency Archbishop Agostino Casaroli. In the course of a fruitful exchange of views, the parties reaffirmed the importance of continuing efforts to consolidate the process of détente in the world [and] the further development of international cooperation and the safeguarding of peace. Motivated by the content and spirit of the Joint Communiqué from the Polish-Vatican talks, as a result of the visit of His Excellence A. Casaroli in Warsaw from 4 to 6 February 1974, both parties have confirmed their satisfaction with the progress made in the improvement of mutual relations. They are convinced that their constructive development is conducive to progress, peaceful stability in international affairs and the normalisation of relations between the State and the Church. 1. As announced in the Joint Communiqué of the Polish-Vatican talks on 4-6 February 1974 in Warsaw, while recognising the need to deepen interaction and cooperation for the sake of détente and peaceful cooperation between countries with different systems, and bearing in mind that this will serve to normalise the relations between the State and the Church, the Government of the People's Republic of Poland and the Holy See have decided to establish a permanent working relationship. 2. The permanent working relationship between the Government of the People's Republic of Poland and the Holy See will be carried out by teams consisting of their own designated representatives. The Parties shall inform one another about the composition of the teams and any change in the participants. 3. The Holy See is cognisant that the Polish team, in order to maintain permanent working contacts, will operate at the Polish Embassy in Rome, and will provide the assistance necessary to uphold the practical co-operation with the Council for the Public Affairs [predecessor of the Section for Relations with States] of the Church or its representatives. 4. The Government of the Polish People's Republic is cognisant that the team (or its members) on the Vatican side, in order to maintain permanent working contacts, will be able, in any case where the Holy See considers it appropriate, to come to the People's Republic of Poland for talks with the competent authorities of the Polish People's Republic, and [the Government] will give the necessary assistance. d) preparation for further official talks between the People's Republic of Poland and the Holy See. 6. The Government of the People's Republic of Poland and the Holy See are convinced that the establishment of permanent working contacts and constructive activities by the teams will create a favourable climate for the further development of mutual relations between the People's Republic of Poland and the Holy See. 2. In the book cited below, this hitherto unpublished document is nameless, but Nuncio Kowalczyk called it the "Protocol of 06.07.1974 establishing working relations". Source: Kazimierz Sidor, Wzgórze watykanusa (Vatican's hill) 1985.